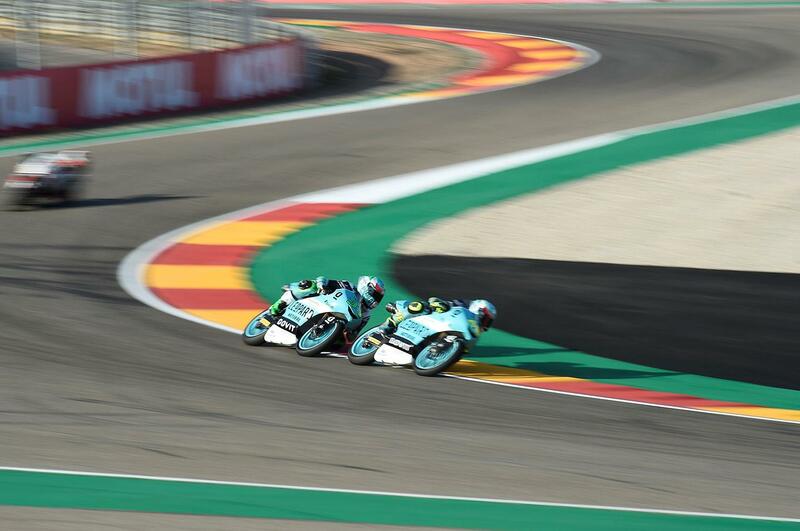 Enea Bastianini ended Friday at the Gran Premio Movistar de Aragon as the fastest rider in the Moto3 field after pulling out two tenths on Gabriel Rodrigo Nicolo Bulega moved up to take third on his final lap to lock the Spaniards out of the top three on their home turf. Bastianini ended FP1 in eighth place, but the number 33 rider looked in supreme form after putting in consecutive fastest laps towards the end of FP2, eventually setting his best time on his final lap as Rodrigo maintained his second from FP1 to round off a very solid opening day. 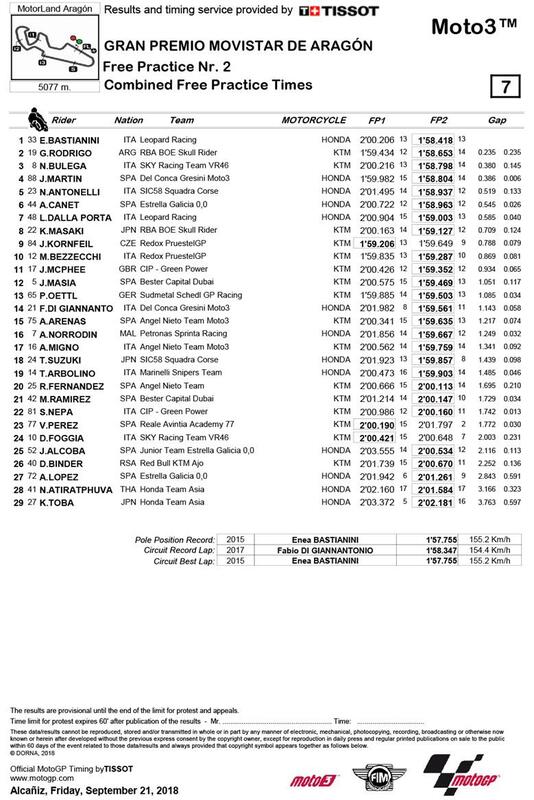 Bulega displaced championship leader Jorge Martin for third at the end of the FP2 session, with the Spaniard setting his lap times on his own to finish fourth on the combined timesheets.Niccolo Antonelli rounds out the top five on Friday despite finishing the morning session outside the top twenty, with Aron Canet stringing a strong last run together to claw himself up the combined timesheets to fifth. Misano winner Lorenzo Dalla Porta ends the opening day at Motorland Aragon in seventh, with Kazuki Masaki eighth fastest after an impressive day for the Japanese rookie. The morning’s pacesetter had been Jakub Kornfeil and he was the only rider in the top twenty who failed to improve his time in the afternoon. It was ninth overall for the Czech rider after a crash in FP1, with teammate and championship contender Marco Bezzecchi rounding out the top ten.